This post was inspired by a blog post i read sometime last year ‘2017’ i cant remember the author of the post but it was talking about the need to embrace our local tourism. The author shared how he took his family for sight seeing in his community instead of going on a vacation to a well know tourist site. even thought he acknowledge the need to go on vacation in other place to experience other culture, see the world and enjoy the wonders of nature and creation. Formerly know as ”Ogulugu” or ”Ogulugu Ugbo”, Ugbo is one of the few aborigines east of the River Niger, south eastern Nigeria. Known for its natural habitat, which includes serene hills, caves, large rocks and stones, rivers, forests, wild animals, and fertile lands. Based on oral history, Ugbo is the ancestral home to many towns in Igboland. Ogulugu as it was formally know as (now Ugbo) is the oldest son of Ewa, the original progenitor of communities, such as Obeagu, Amoli, Agbudu, Isu-Awaa (Ewa), Ituku, and Ogbaku. The Ewa (Awaa) kindred, together with Ntuegbe, make up what is known as Mbanabor clan in Awgu LGA of Enugu State. Ugbo is located in northwest part of Awgu Local Government Area of Enugu State. Based on 2006 census, the population of the town is projected to be about 32,000. Ugbo is made up of three large villages, namely, Ugbo-Okpala, Ugbonabor, and Ngene Ugbo. The town occupies a vast area of land bounded by other communities, such as Obeagu to the southwest, Achi to the west, Amoli to the northwest, Owelli to the north, Ogugu to the east, and Mmaku to the south. The Primary source of water in Ugbo is the famous Oji-River, which originates at Ishi Oji in Agu Ewa in Ugbo. The river traverses through the entire town before flowing to the neighboring communities. Ugbo witnessed modern developments in water resources through the construction of Ugbo Dams and Water projects. 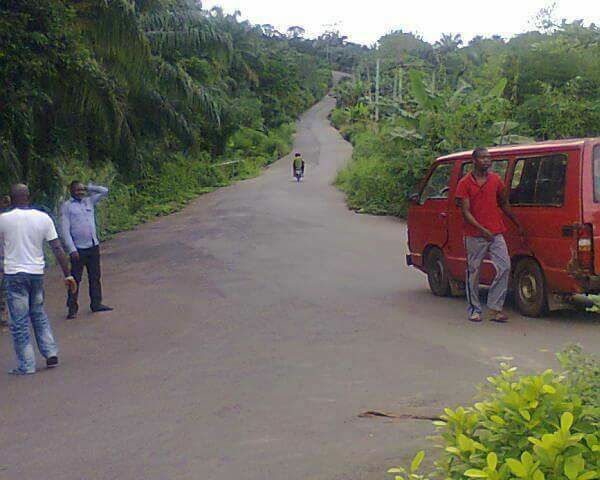 Ugbo also boasts of two major roads: the 5 km Ugbo-Achi and 4 km Ugbo-Mmaku roads. These roads saw wide-scale construction activities during the Jonathan administration, although the road hasn’t been completed but a greater portion of the road has been constructed especially at ugbo section. Ugbo has a diversified economic base. The town is blessed with highly qualified manpower as evidenced by individual successes in the fields of agriculture, education, politics, trade and industry. Ugbo is also endowed with abundant but untapped natural resources, including stones, clay, iron, fertile land, and traces of coal and gas deposits. The agricultural mainstay of the town is cocoyam and cassava cultivation while palm oil and oha are also the main source of revenue in the community. The Ugbo cocoyam (Ede ndi Ugbo) is the choice of buyers who travel from all parts of Southern Nigeria to the central market, Nkwo Ugbo where sellers from the three main villages converge after four market days. Well, this is all for now, as time goes by i will be sharing more information about the town, places to visit in the town and things to do and the need to visit hill town. ← Abacha by Igboist Kitchen Members. what a beautiful, rustic place! I am charmed by the simplicity of it all, and yet, the beauty too! Interesting blog filled with great information. I have never heard of Ugbo. It is more than cold, especially during harmattan.. we hardly come out in the morning and evening during that period. you are lucky that you stay in such a beautiful place. Your concept of promoting your hometown to the world is really appreciated. thank you. Great article! Thanks for promoting naija! Very interesting information. Your town not only has an unique history but also has a lot of resources. Not only that but is pretty as well. What a wonderful place to live! You are right, we need to enjoy the beauty of our surroundings, and support the local economy by vacationing close to home from time to time. This looks like such a beautiful, secluded place to visit. I love your photos of the landscapes! What beautiful photos! Thank you for sharing photos of your town. It looks like an amazing place. I love that your government is urging the people to go and explore their local places more. Ugbo sounds like the place to be when you’re looking for some quiet/down time. It’s peaceful and relaxing. This sounds like a lovely place to visit. So much greenery. It looks like a wonderful place to explore. Wow, I am Nigerian and I never heard of this town. Thanks for educating me. Great post! This town sounds very interesting. Would love to visit. Sounds like an interesting history of where you live. I love learning about all the local festivals. I hope to learn a lot more about you and your hometown in the near future. How beautiful place Ugbo hill town is! Indeed we need to support the locals and yes I love the fact that they celebrate local as well as global festivals! What a beautiful place! I loved reading these interesting facts about Ugbo and it would be great if I could visit this place someday. This looks like such a quiet place to visit. Amazing photos and fun suggestions! I would love to visit this town sounds very interesting and I love when towns and locals come together and support one another in such a way.